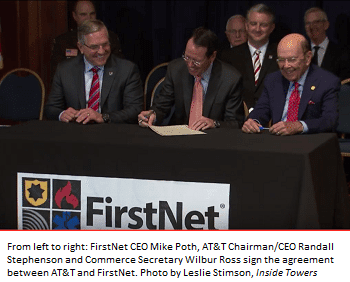 Today the Department of Commerce and First Responder Network Authority (FirstNet) announced the selection of AT&T to build the first nationwide wireless broadband network dedicated to America’s first responders. Ever since the AT&T-Mobility 911 outage that affected customers in several states the night of March 8, the FCC has been trying to figure out what happened. Preliminary information indicates the outage lasted five hours in the primary affected areas (the southeast, central, and parts of the northeast) but its effects spread throughout the regions, according to Public Safety & Homeland Security Acting Bureau Chief Lisa Fowlkes. Concepts like “Dig Once,” are gaining traction on Capitol Hill as lawmakers grapple with ways to remove barriers for the deployment of broadband infrastructure. In a hearing this week covered by Inside Towers, the House Subcommittee on Communications and Technology discussed draft legislation first proposed by Rep. Anna Eshoo (D-CA) and Greg Walden (R-OR) in 2015 that would require installing a conduit during construction of a federally-funded highway or road in an area that needs more broadband. 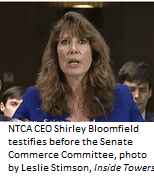 The Competitive Carriers Association says there’s plenty reason to justify repealing the FCC’s 2016 Privacy Order which it calls “burdensome and anti-competitive.” CCA suggests the FCC align its rules with those of the Federal Trade Commission. Broadband deployment and the transition to 5G were dominating topics at Wednesday’s FCC oversight hearing by the U.S. Senate Commerce Committee. Net Neutrality was as well and to some extent, new Chairman Ajit Pai’s efforts at process reform. Frequently in the news are stories about American corporations outsourcing jobs to foreign nations, but perhaps less often we hear of jobs being “resourced” back to the United States. AT&T recently announced it promised to hire 3,000 American workers to do jobs previously done overseas as part of an agreement it made with the union representing its workers, reports the New American. “Millions of Americans still do not have access to the internet, most of them in rural communities,” says U.S. Senate Commerce Committee Chair Sen. John Thune, (R-SD). In many parts of the country, states have stepped in to pay to “continue to bridge the digital divide,” he said during Wednesday’s nearly three-hour hearing on infrastructure. Ideas generated yesterday could potentially become part of the administration’s $3 trillion infrastructure package. FCC Chairman Ajit Pai is committed to making it easier for companies to deploy broadband infrastructure and a “light touch” regulatory approach from the Commission in general. Speaking to attendees at the Mobile World Congress in Barcelona on Tuesday, Pai recognizes that building, maintaining and upgrading broadband networks for 5G will be expensive.